Snorecoach Review - Does the Smart Device Work? Snorecoach is a Bluetooth device that works in tandem with a phone app. It was developed through support from a Kickstarter campaign which raised a little over its target of $200,000. The device allows you to monitor your snoring and prompts you to change sleeping position when needed. The invention became available for purchase in August 2017. 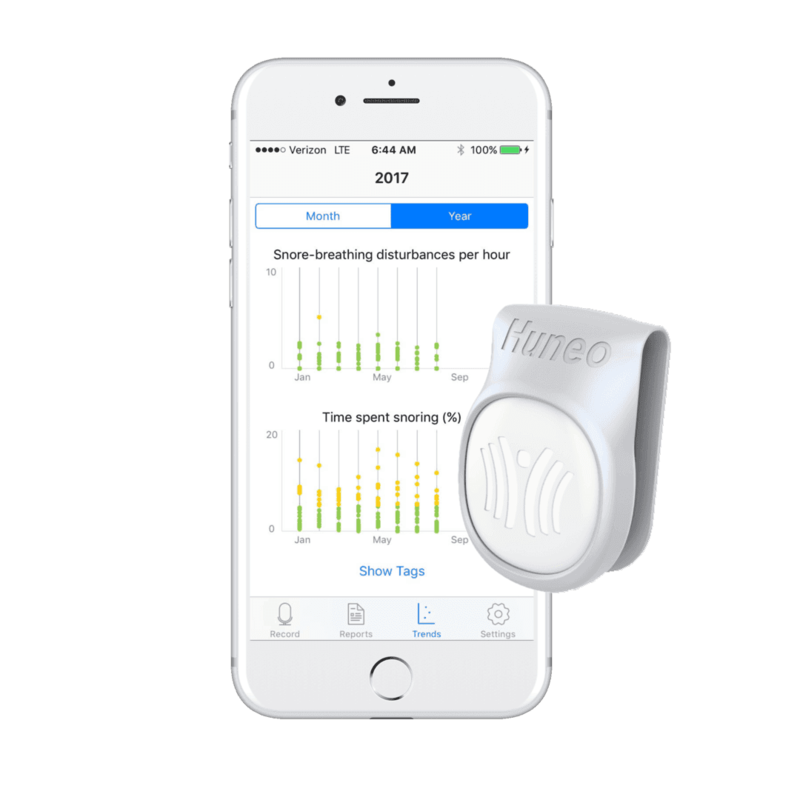 Huneo aims to use real-time data collection and analysis to use technology to solve medical problems. The company’s specialty is the use of big-data to allow for the effective application of technology. Their early work involved a large number of sleep studies. The analysis of this data was used to develop algorithms that can identify snore patterns that are associated with Obstructive Sleep Apnea. It is from this study that Snorecoach was born. There are two parts to the system the app, Snoretrack, that runs on a phone or tablet and the device that fits on the back of your shirt. The app is free to use and is available for both Apple and Android devices. The Bluetooth device costs $98. The app uses the speaker on your phone to monitor your sleep. When it detects you snoring it sends a message to the Bluetooth device. The device then vibrates to signal you should change sleeping position. There is an accelerometer inside the device which allows it to determine if you are laying on your back or side. This means you only receive a ‘buzz’ when you are both snoring and lying on your back. The theory behind this is that most people are more likely to snore or to experience an event of sleep apnea while sleeping on their backs. So, for much of the time, a positional change is all that is necessary to stop the snoring. Over time the Snorecoach essentially trains you to turn onto your side, as soon as you start snoring. The device has been designed to be as unobtrusive as possible. It simply clips onto the back of your shirt, so there is no discomfort associated with its use. The motion of putting the Snorecoach onto your shirt is all that is needed to activate it. The app allows you to monitor your sleep. Each night you receive a summary of your sleep. This includes audio recordings of your snoring. It also uses data from the device to monitor your movements during the night. The data can be used to give you an insight into your sleep. The app allows you to collect data over a long period, years if you wish. You can look for trends in your data, to try and ensure you get more and better sleep. 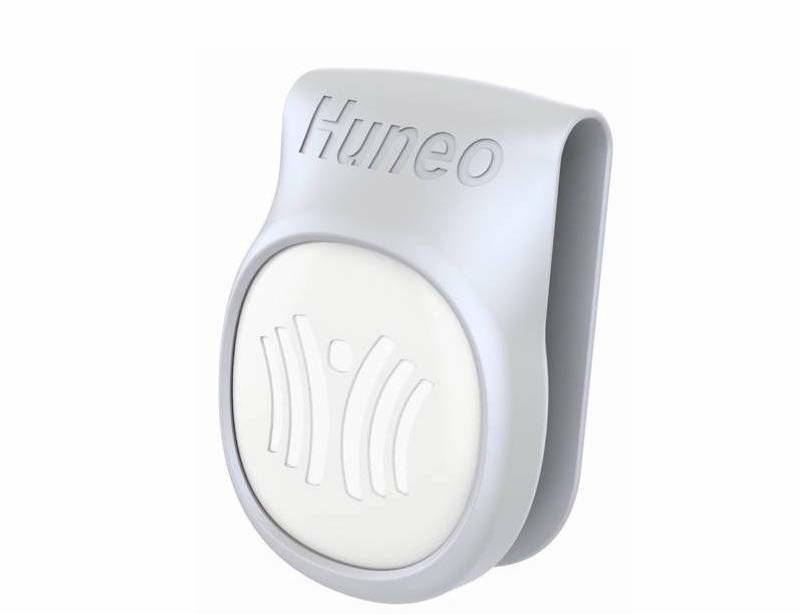 According to Huneo’s data, for positional snorers, this device, on average reduces snoring from 22% of the night to 4%. So, for a subset of snorers, this is a pretty effective system. It had the benefits of being completely non-invasive, after all, it is only a small device clipped to the back of your shirt. In essence, Snorecoach is replicating the effect of being elbowed in the night by your partner, hopefully just before you disturb their sleep as well. If that is all you need to keep you from snoring, this could be a product worth trying. The real gem here is the app, Snoretrack because it provides you with a large amount of useful data, and it will allow you to get a real feel for how the quality of your sleep is changing over time. The app works independently of the Bluetooth device; you just have to remember to turn it on when you go to bed. How does it compare to other snoring aids? This device is promising, but as it is very new to the market, it is hard to say how effective it will be for most people. 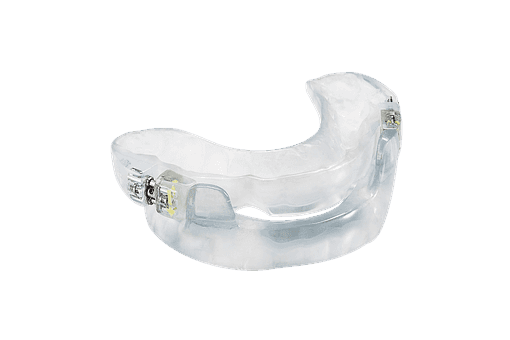 In my opinion, it is not as effective as the leading anti-snoring mouthpieces. The SnoreRx, for instance, retails at a similar price, has been tried by a much larger sample of people, and is a more reliable solution for stopping snoring. Given that one of the aims of the Snorecoach is to help you to develop good sleep habits, there is no reason you couldn’t use it in combination with a more instantly effective snoring aid. The battery in the Snorecoach should last six months before it needs to be replaced. It is a standard coin-cell battery that is easy to replace. Using the app overnight should use about 10% of an average phone’s battery. The app does, however, advise that you plug your phone in overnight. You can use the Snorecoach as a silent alarm. You can set it to vibrate to wake you up in the morning without disturbing your partner. The recently added feature of being able to play back your snores from the previous night is surprisingly addictive. You don’t need to worry about your phone’s memory becoming clogged up with the recording of your snoring as the app automatically records over the previous night audio. You don’t need to turn the app off in the morning. It will automatically stop recording after a pre-set amount of time has elapsed. For Apple devices, you need to be using an iPhone 4 or higher, or an iPad 3 or higher. It works best when the phone is placed within five feet of your head. The data you can collect about your sleep is fascinating and useful. The silent alarm is a great bonus feature. If you don’t have a smartphone, this product is going to be of no use to you. It will only be effective if your snoring is purely an issue of sleep positioning. It is a fascinating device. It is easy to use and not as intimidating as some other options, but it won’t work for everyone. The data collection aspect of the app is one of its strongest features. It is certainly worth trying, but you may want to try combining it with another stop snoring device, such as a snoring pillow or a mouthpiece. Since there is a money back guarantee you have nothing to lose by giving it a go.